Thanksgiving is here and we are all busy planning who to invite and what to serve. This year, include your little ones in the celebration by helping them make place markers for each of your guests. I first got the idea from the Leaf People Craft at www.ActivityVillage.co.uk. Then, as I parused old magazines and caught up on blogs, I discovered lots of people transforming nature's bounty into art. I sure do feel left out of the idea circle on this one! As often as we take nature walks and as much "bounty" as we collect, shouldn't I have come up with this idea earlier? I don't know why I never thought of this but it is never too late to get on the bandwagon. So, we went on a nature walk. We brought home our bounty. I covered the floor withour all-purpose blue tarp. Then, we set to work for a fall afternoon full of crafting. Be sure to encourage everyone's creativity. Whether it is abstact or complex, simple or not, praise the children for their efforts. Art is beauty. And, beauty is in the eye of the beholder. To Make the Creatures: Glue together natural items and crafting elements to form turkeys, people, aliens, fairies, or anything else that you can think of. To Make Placecard Holders: We cut the faces out of pictures of people coming for Thanksgiving lunch. We glued the faces on bodies made from our supplies. If we didn't have a picture of the person, we made their faces using craft items and labeled their "shirt" or "hat" with their name. Party Favors: If you don't want to use these on the table, you may attach a ribbon to the top of the creature or person. This can be hung on an old tree branch and given as a gift. Proudly Display: Once all of the art is finished, you may proudly display it or pass it along as Thanksgiving gifts. At our house, I hung pieces of cotton twine in the windows like garland and used wooden clothespins to string the leaves that were decorated along with the Thanksgiving artwork that accumulated throughout the fall. I also ended up with lots of pinecone people, turkeys and pheasant. I piled those in a rustic basket and kept it on a shelf for all to investigate and enjoy! ALLERGY NOTE: There are all kinds of fun things to be found in nature. But, these items can be allergens. 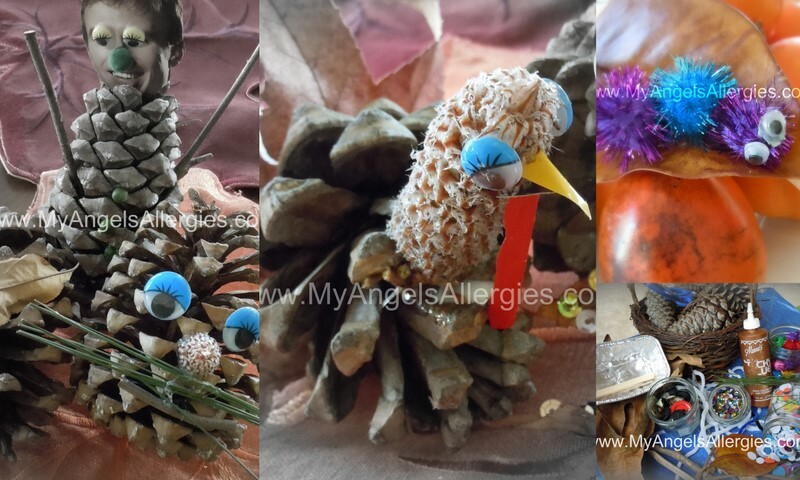 Whether it is the pollen coating the items or the seeds and nuts that can be gathered, this activity is a perfect opportunity to educate your allergic child. Help them to understand how to properly handle allergic ingredients. Teach your angels to wash after crafting and never to touch their face or eyes while playing with these natural items. It is important for children to develop a healthy awareness and knowledge of how to manage situations when they encounter allergens. Natures bounty is all around us and it is better for them to address any allergens while they are with you rather than when they are not.